The ergonomic S-shaped handle is easy to steer for maximum control and better reach with natural and precise movements, all over your body. 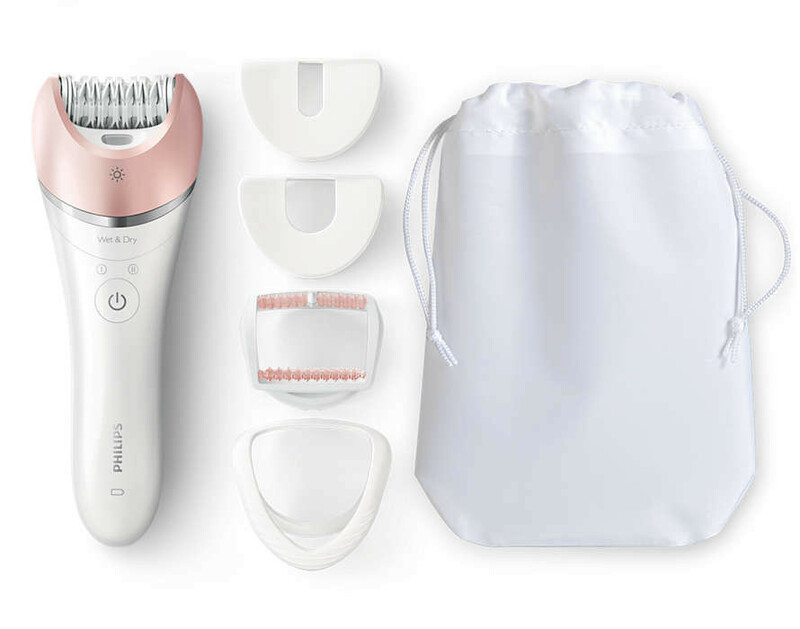 Our epilator head is unique in being made from a rough ceramic material that grabs hair firmly: even fine hairs won't slip from its grip. 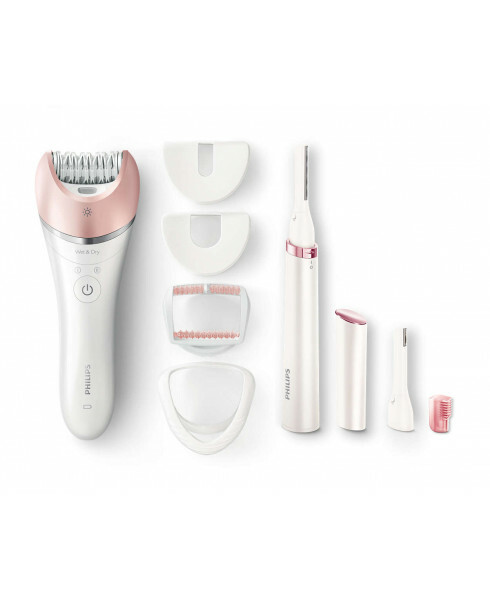 Our widest epilation head for optimal hair removal in one stroke for long-lasting results. 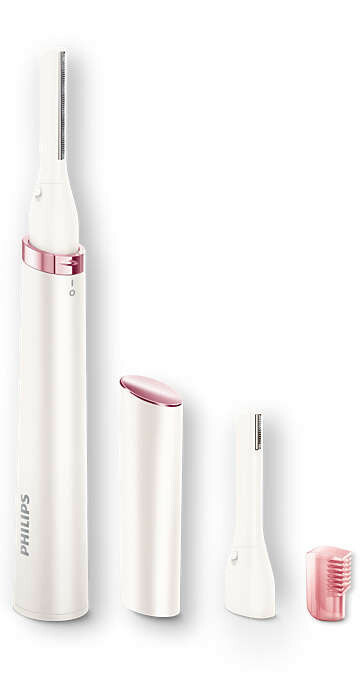 All of our Philips epilators have a unique system where the tweezers lift and gather the lying hair and guide it to the pulling point, firmly grabbing and pulling out the hair. 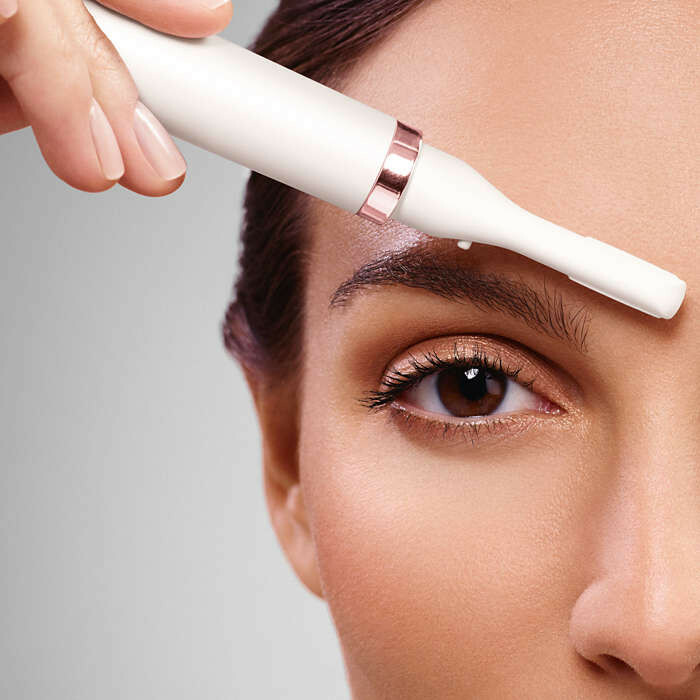 Combined with the unique round ceramic discs, this means it epilates closer to the skin for optimal results and more gentle treatment. For a gentle and comfortable use during your shower or bath routine with anti-slip grip for optimal wet and dry use. 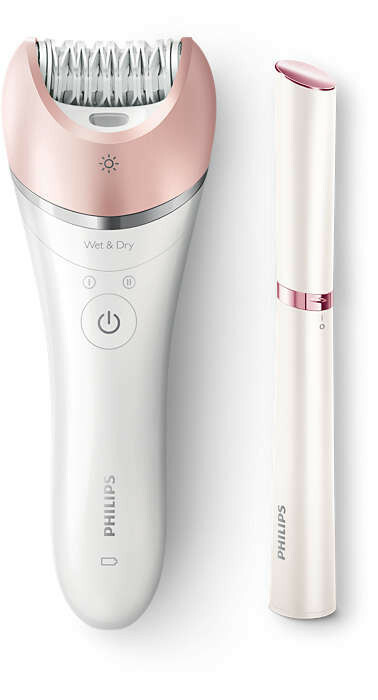 Unique light ensures you don't miss fine hairs for best epilation results for all body parts. 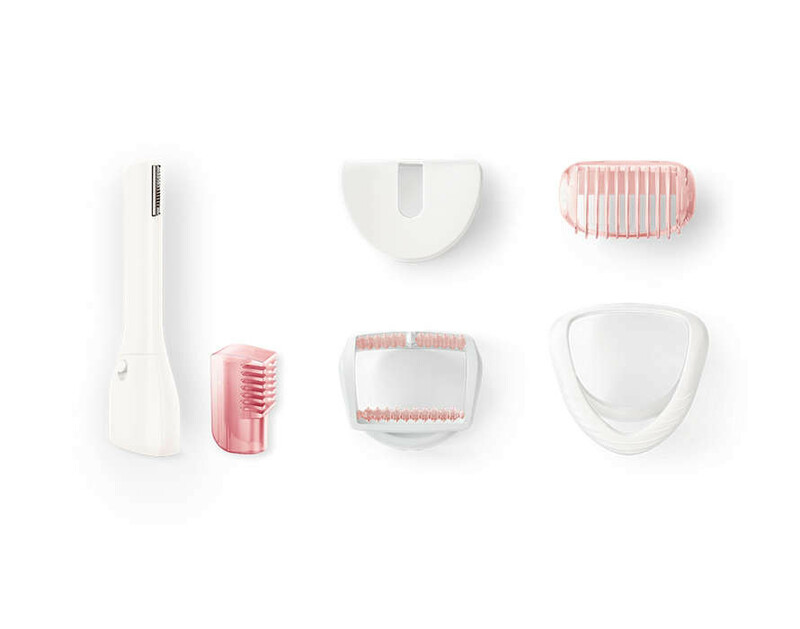 Body care heads will bring more personalised and convenient solutions to her individual beauty routine for hair removal and beyond. 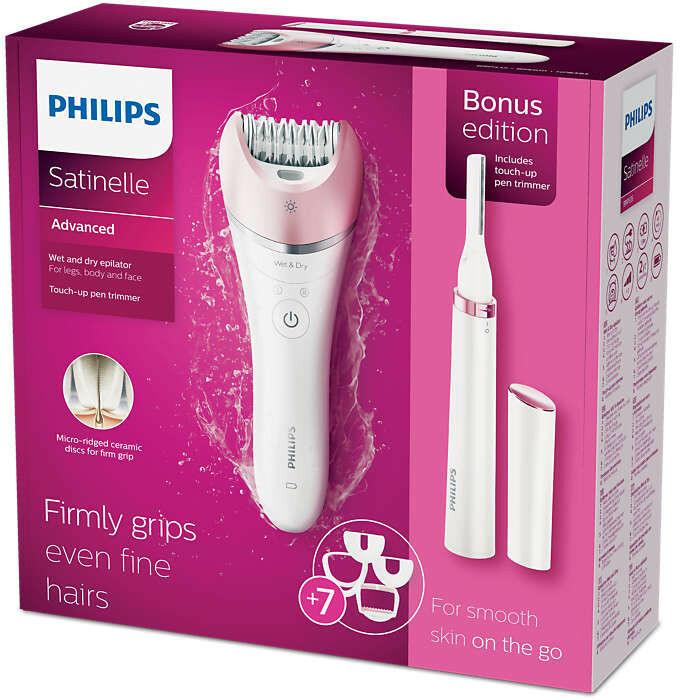 The Philips Satinelle will always give you the best performance when used at a 90-degree angle. Stay smooth. Whenever, wherever. 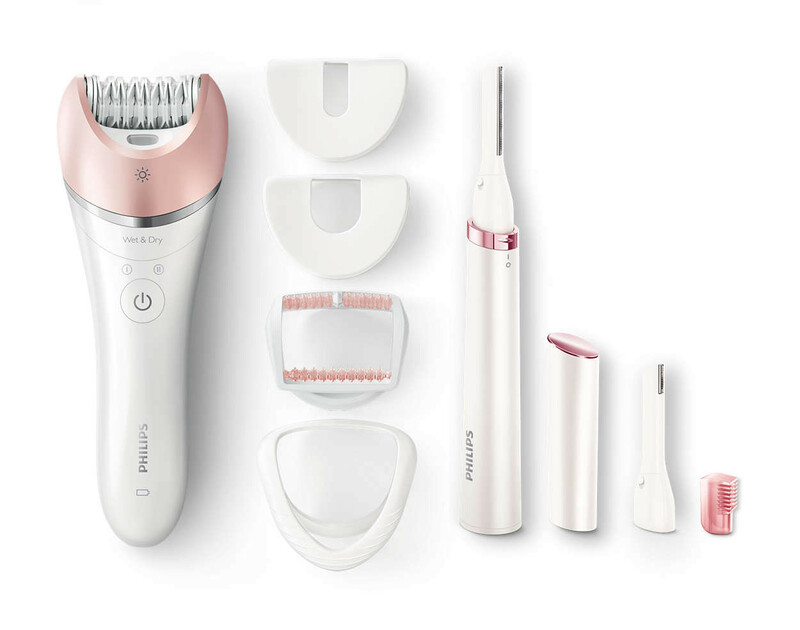 The new on-the-go trimmer from Philips is a discreet beauty tool that makes it quick and easy to remove even the finest body and facial hair on the go. It comes with a cleaning brush for extra hygiene. For more gentle treatment in all different body areas it includes a facial area cap that removes unwanted facial hair and a delicate area cap for underarm and bikini hair. Massage cap eases the epilation sensation. Skin stretcher cap tightens skin during epilation.